Pre-Islamic Carpets and Textiles from Eastern Lands by Fredrich Spuhler contains research of carbon dated carpet pieces from the 2nd – 4th centuries CE. He describes these rare art pieces in detail, relating them to the art of the Sasanian and Sogdean civilizations. This book, the 4th in the series, is scholarly and fascinating. Spuhler goes in-depth to identify the types of knots, discusses the importance of color, and passionately honors textiles as a legitimate form of art to be collected, admired, and studied. Rag Rug Creations by Lynn Stein describes rugs found in 2000 BC in Egypt, Bronze Age graves, and Viking and Celtic tombs. 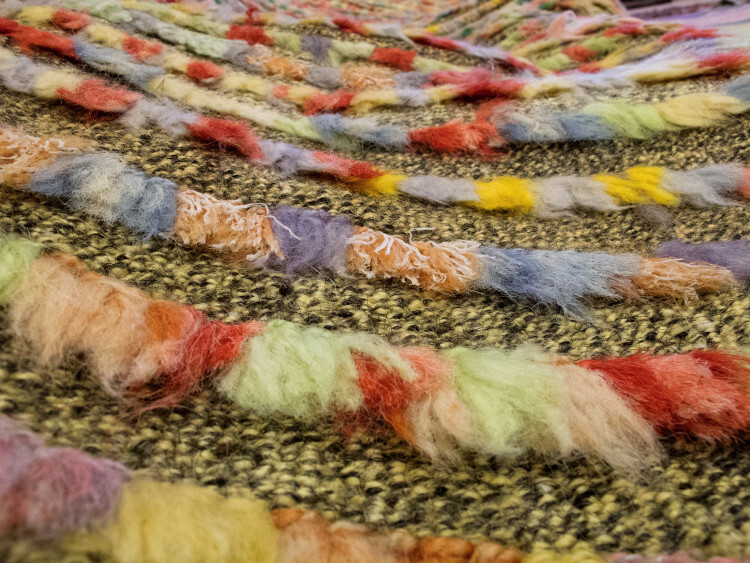 She considers rag rug-making a joy and restful art form that lends itself to collaborative work to inspire others. A project book for one person or groups, Rag Rug Creations includes Stein’s inspirational gallery of work. Rag Rug Creations by Lynne Stein © 2014 and Pre-Islamic Carpets and Textiles from Eastern Lands by Fredrich Spuhler © 2014 were donated by Bloomsbury Publishing, Inc. There are now over 800 books and magazines in the Library’s rug and carpet collection. Textile Center hosts a fiber art drop-in group (open to all) every Tuesday morning to work on a variety of types of art in our Library. Many of them are rug-hooking artists. Visit the Textile Center Library and enjoy your artistic passions!